Automotive recalls have been increasing, both because of the sheer volume of the GM recalls and others that haven’t gotten as much press, and because of automakers who have just gotten proactively trigger-happy — an effort to beat National Highway Traffic Safety Administration (NHTSA) to the punch. Well, the good news is that automakers, especially General Motors, have gotten pretty good at making sure the recall experience where it happens — at dealership service bays — is good. J.D. Power and Associates, in a new study, says that while the percentage of all dealer service visits related to automotive recalls has hit 16% (the former peak was 15% in 2011), satisfaction among recall customers has risen as well. The firm’s new 2015 U.S. Customer Service Index (CSI) Study finds that the overall CSI among customers who take their vehicle to a dealer for recall-related work improved to 789 on a 1,000-point scale, up from 777 in 2014. All of GM’s brands are among the top five automakers in customer service. In the study, based on responses in the fourth quarter of 2014 from more than 70,000 owners and lessees of 2010 to 2014 model-year vehicles, Jaguar ranks highest in satisfaction among luxury brands. Following Jaguar in the luxury ranking are Lexus, Audi, Lincoln, and Cadillac. 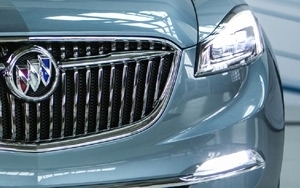 Buick ranks highest among mass-market brands for a second consecutive year, followed by Mini, Volkswagen, and GM’s other units GMC and Chevrolet. Then comes Toyota, Hyundai, Kia, Honda and Nissan. An express lane for customers was a big plus, substantially outperforming those that do not offer it. Internet service appointment scheduling isn't a big mover, however, with only 9% of customers booking appointments via the Internet, compared with 73% who call for an appointment, per the firm. Forty-five percent of customers say they are unaware that Internet scheduling is available to them. Satisfaction is substantially higher among customers who work with the same service advisor they worked with in the past.